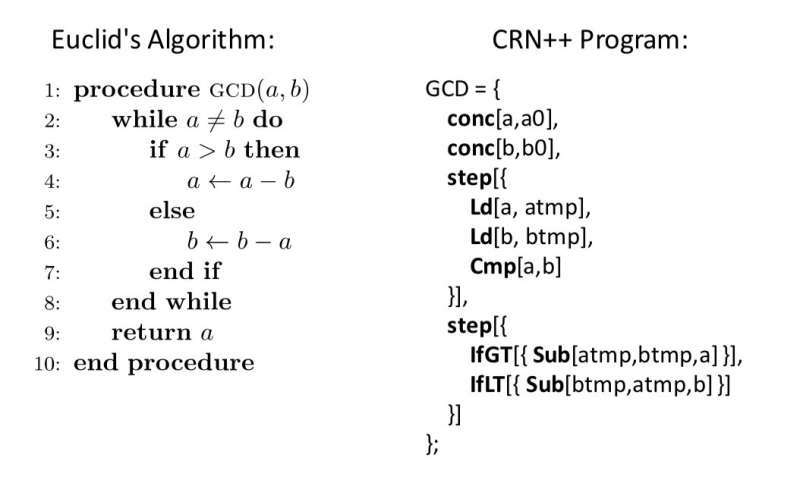 The Euclid's algorithm and how it will be written in CRN++. Credit: Vasic et al. Synthetic biology is a relatively new area of research that could significantly impact a number of fields, including biology, nanofabrication and medicine. A primary challenge in this emerging field is that of embedding computation in molecular contexts, in situations where electronic micro-controllers cannot be inserted. Doing this requires the development of methods that can effectively represent computations using molecular components. "A key technical challenge of synthetic biology is to design a chemical controller that interacts within a cellular environment, achieving a particular task," Marko Vasic, one of the researchers who carried out the study, told Tech Xplore. "To achieve this, it is necessary to both engineer synthetic molecules and program them. Molecules interact via chemical reactions, and by programming molecules, we mean defining interaction rules (chemical reactions) between them." Recent improvements in DNA synthesis have opened up new, exciting possibilities for molecule engineering. However, researchers in synthetic biology first need to devise ways to design the interaction rules (chemical reactions) to achieve a desired goal. The main objective of this recent study was to design a higher-level language that could express the behaviour of chemical reactions in a more intuitive way. 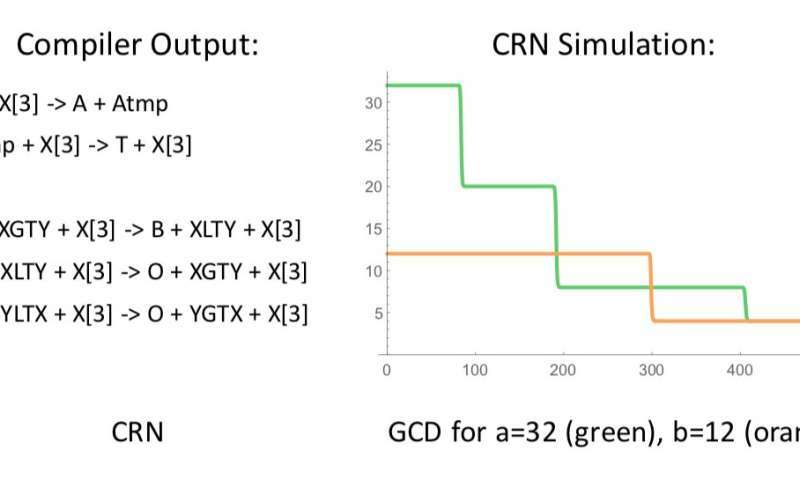 The output of the compiler as well as simulation results for the CRN++ program. Credit: Vasic et al. Every object is set of objects defined w/ only 1 object w/ 2 attributes; allowing memory to be an object and a function of every other object; then just cut, paste, slice, calculate, play human. Necessary and sufficient isomorphic or Onto Reality. The thing about computers as physical systems is how religiously discrete, error free and deterministic they are. If these folks invents some new constructs to deal with stochastic behavior and error, they'll be doing computer science a favor as well as chemistry.